This thread is being started with the collective effort of many Kishore Da fans on this board, like Marcilo bhai, Azad Bhai, King Kishore Bhai, Eskayes bhai, to name a few. This launch is being brought to you as a joint venture by - ALL KK FANS on a great auspicious day that is 4th August, our Guru's 79th Birthday. The main idea behind this thread is to list out all the released movies featuring Guruâ€™s songs and upload these songs in good quality. 4th August is specially chosen to launch this thread as it is Guruâ€™s birthday. It is being observed that somehow knowingly/unknowingly we are creating a quagmire of the threads, e.g number of threads are being launched for single song request/upload, and many threads are being uploaded with request of re-upload of same songs at the same point of time, in spite of links being active etc. etc..
Our proposal for this sub-board would be to have certain ground rules as given under to follow for this thread and also to check the number of meaningless threads mushrooming on this Guruâ€™s forum. This would not only make it easier to surf this board or its threads, but also allow us to focus on Guruâ€™s songs and share these gems across members. The list of movies along with Guruâ€™s songs of that movie will be posted in alphabetical order. As this thread will be, over a period of time, covering almost all the songs ( available) from released movies, we propose to make the thread a valuable treasure chest of information on the songs with interesting trivia and information that is worth registering under the thread and there will be linkups with other threads if there are interesting info regarding these songs. Videos/pictures of the songs being covered/uploaded on the thread may be uploaded on Few Guruâ€™s Videos a thread started by Marcilo Bhai, with a link to the respective songs on this thread. Outside video links such as youtube etc may be added to this thread related to respective songs. All regional songs (audio Version only for video Guruâ€™s video is to be used) may be uploaded on Guruâ€™s Bengali Songs a thread started by Jhumroo Bhai ( it would be wonderful he could rename his thread as Regional Songs of Guru) with a link to the respective songs on this thread. Music Director-wise/ Mood/emotion wise discussion will take place on all the already existing threads started by Venu Bhai and links will be provided both ways to the songs under discussion. Lyrics of the songs being uploaded on this thread will be added on Xice bhaiâ€™s lyrics thread, which will grow into a complete album of E-Lyrics Book of Kishore. Songs on the proposed thread will be meticulously linked to all the relative lyrics. Once a song is uploaded and removed by HF after expiry of 30 days, a request for re-upload may be made on Re-upload thread, which will keep the clutter out of this thread. Use of single thread for re-upload will help us in accounting the re-uploads as well as avoid repeat requests till the links are active. New members should get chance to re-upload the requested songs first. This will help them to maintain the ratio issue. Every member downloading the song is requested to at least post a reply or respond positively towards the members managing this thread. Members are requested to keep this thread free of unwanted discussions/personal posts. Some threads may be used for this. HT Bhai is simultaneously launching a thread for discussion on Guruâ€™s songs with lesser known Music Directors, which also include the Popular MDs for whom Guru has sung a limited number of songs e.g. O P Nayyarji, Naushadji etc. However these two threads will have cross links to uploads to avoid duplication. For proper management of this thread we propose following roles and responsibilities. We are requesting the following members to help us and co-ordinate the thread effectively. 1. We request - Marcilo bhai, Ez_buddycool bhai, Eskayesbhai to co-ordinate the following. connected threads and the main thread, if they are not added already. ordination to Marcilo bhai and Jhumroo bhai. Mood/Emotions, Category etc and update the links. I hope that we all can work together enjoy with more focussed and shared effort. things can be made agreeable and feasible to all before we start posting lists of films and songs. trivia about Kishore for the future members to relish. Note: Please follow these guidelines if and when you upload songs that will be linked to the songs database. The songs are uploaded on request only. The songs will be uploaded on related request thread whose link is provided below the list of movies. start this thread on such an auspicious day. Nice effort buddycoolji,hope that this thread will be a grand success. Please post any details required to be corrected. Cool BHAI AND Musicman BHAI ARE TWO GREAT MEMBER OF OUR BOARD. MY ALL REQUEST FOR SONG I POST HERE. HOPE THIS THREAD HAVE GRAND SUCCESS. This will most likely be the biggest project on this forum- a mega project. With experts like Marcilo bhai, Azad Bhai, King Kishore Bhai, Eskayes bhai, HT bhai etc. we can hope to make it a grand success. Come on members,lets proceed with more songs of guru. Please note that other movies having numbers in title but released with alphabetical names such as Char Paise, Fifty Fifty will be taken up in alphabetical order only. Mbhai remix versions bhi hai youtube pe.. Lekin main itni jaldi marna nahin chahata hoon. Bhai relax! I did NOT add those links here. Navin Nischol and Leena are both in CIDs role. Two arguing and oversmart CID officers finally fall in love while solving a case. Lyrics have been posted for this song at the following link. Must be a thrilling movie. Full mast mast film. Leena looks cute. Video link of this song. Director Kundan Kumar - has directed many movies in the past - Some of them are - Aaj Ka Mahatma (1976), Duniya Ka Mela(1974), Anokhi Ada (1973), Pardesi (1970), Aulad (1968) , Main Suhagan Hoon (1966), Bade Ghar Ki Bahu (1961), Raj Sinhasan (1958), Teesri Gali (1958), Neel Main (1957). Starcast - Randhir Kapoor, Rekha , Ranjit, Bindu, Manmohan, Keshto Mukherjee, Jeevan, Ramesh Deo and others. 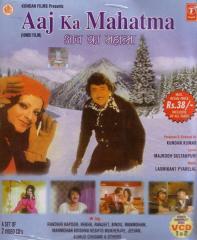 Our Next Movie " Aaj Ka MLA Ramavtar 1984"
Viju Khote, Shubha Khote, Mohan Choti, Satyen Kappu, Jagdeep. Star Cast - Shreeram Lagoo, Romesh Sharma,Helen, Lalita Pawar, Baby Mona, Jalal Agha, Madan Puri, I.S. Johar, Chandrashekhar , Ramesh Deo, Master Tito, A.K. Hangal, Ilaben, Neelam. The only Kishore song in this movie comes in parts .It starts off as title song and there are several stanzas split over the movie. The sad version is also picturised when there is a loss in the family. (sad version - stanza - Meri mamta ki nishaani bin mitaaye mit gaye.. ). Worth buying the vcd just to get it all! NEXT MOVIE " AAJ KI DHARA OR AAJ KI RADHA"
PADMA KHANNA, BIRBAL, MOHAN CHOTI, PRADEEP KUMAR, JANKIDAS ETC. Yeh mard bada bedardi hai - Picturised on Paintal and Padma Khanna. Post your requests for songs or videos if any on the following thread.